Thanks for sparing me the need to draw a new image, Oscar! To summarise in a very brief way (seriously, read the article! ), simulcast is a way to send multiple streams at the same time (typically different qualities of the same source), thus allowing recipients, with the help of components like SFUs, to receive one or another depending on their bandwidth or application requirements. For instance, a user may decide to receive the low quality of a conference participant because they don’t have enough bandwidth to receive the good quality one; or maybe they want the low quality version because they’re currently displayed in a thumbnail, and anything with a higher resolution would be a waste of data. Bottom line, what’s really important is that simulcast gives you the option to provide different alternatives that recipients can then take advantage of: as such, it’s a common feature in most conferencing applications. spec version of rid-based simulcasting (Chrome >= 74). 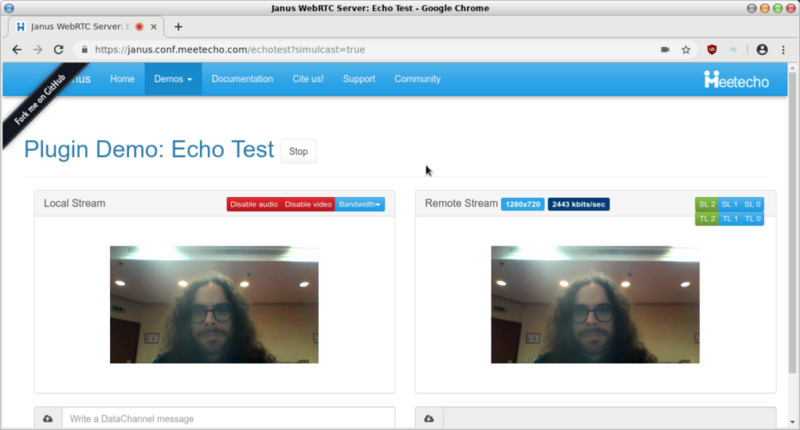 We’ve supported the first two approaches in Janus for a while already, but we now (finally!) support them all, so let’s have a look at what those approaches are, what we had to do in order to get them to work, and what may happen in the future. SDP munging is how “traditionally” simulcast was first introduced in WebRTC. At the time, simulcast was a hidden and not advertised feature, only meant to be used by Hangouts: as such, the only way to enable it outside of the context of a Hangouts session was to manually modify the SDP in a similar way, in order to add the required fields before passing the SDP back to the browser. This is what the “SDP munging” term refers to: you create your offer, tweak it, and then enforce it via a setLocalDescription. That’s it! When you do that, the browser enables simulcasting on the stream, meaning that it will start encoding three different streams at different quality and bitrate. Temporal layers are enabled too for each of the substreams, when VP8 is used, which is a nice added value. As you can see (and as you probably knew already, if you ever played with the simulcast support in Janus), additional controls appear in the demo when you enable simulcast. The buttons allow you to select which substream or temporal layer you want to receive, and give you some feedback on what you’re getting right now: in the snapshot above, we’re receiving the high quality substream (SL2) and all temporal layers (TL2); clicking the other buttons would allow you to receive a different one (e.g., SL1 for the medium quality substream), assuming the browser is sending them. In Janus, this is made possible by the fact that those additional SSRCs are properly detected, which in turn enable the simulcast support. Plugins are notified about this accordingly, and SSRCs are used to automatically demultiplex incoming packets, i.e., to figure out to which substreams they refer to. Specifically, Chrome and Safari list SSRCs in increasing order (low, medium and high quality), which makes it easy for Janus and its plugins to make assumptions on how to demultiplex the traffic. Temporal layers, instead, are detected by looking at the payload itself: at the time of writing, temporal layers are only enabled for VP8 when simulcasting, which means that H.264 does not add them instead. While SDP munging “works”, it’s definitely not the proper way to do simulcasting. Without delving in too many details, the specification explains that you should configure the different encodings programmatically via API instead: this will in turn result in those encodings to be advertised in the SDP as different rid (restriction identifiers), whose values will also appear in the related RTP packets as RTP extensions. a low quality stream (rid=l, 1/4 resolution, maximum bitrate of 100kbps). This is already a huge difference to SDP munging: in fact, in the previous chapter we saw how we could only add those two additional streams, but we had no way of configuring anything else. The quality of the streams and the related encoding properties are hardcoded in the browser. The ability to have more control on what to send and how is of course much better. The above snippet is what we do in janus.js when simulcast is enabled in Firefox, but of course different values are definitely possible and may yield better result in specific use cases. As you can see, while Firefox is still giving us the three different SSRCs that will be used for the three substreams, there is no SIM ssrc-group: the rid values are used instead for the purpose, specifically in dedicated a=rid attributes to name them, and in a a=simulcast line to tie them together. Notice that this syntax, while very close to the current spec, is not 100% compliant: in fact, at the time of writing Firefox still only supports version -03 of the simulcast draft, which is apparent from the extra rid= in the a=simulcast line that shouldn’t be there. Finally, since those rid values will need to be included in RTP packets, the related RTP extension (urn:ietf:params:rtp-hdrext:sdes:rtp-stream-id) is negotiated as well. From a visual perspective, nothing changes, and that’s on purpose: the functionality, as far as end users are concerned, is exactly the same, and so are the buttons and feedback related to the simulcast functionality. Very simply, Janus accepts the RTP extension and the simulcast offer by explaining it will handle those streams in receive mode. Once that happens, Janus inspects all incoming RTP packets to look for the rid in RTP extensions: when one is found, it is compared to the negotiated values. 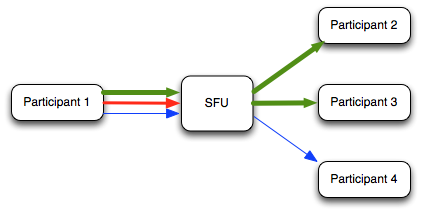 This is needed to figure out which substream the specific packet belongs to, and which SSRC is being used for the related RTP session: in fact, while Firefox advertises those SSRCs in the SDP, there is no explicit relationship between them and the rids, and just relying on their order may lead to wrong assumptions. Once these relationships are established properly, Janus can start using SSRCs for demultiplexing packets instead (which is more efficient than comparing strings), at least until an unknown SSRC is detected which would involve looking for the right rid value in RTP extensions again. As anticipated, while Firefox implements rid-based simulcasting almost the right way, it’s not currently in line with the spec. Recently, more precisely from M74, Chrome started implementing the spec version of simulcast instead, which should hopefully replace the legacy SDP munging it has been doing so far. As you can see, rather than looking for an existing sender and updating its parameters, in this snippet we’re providing the desired encodings right away when adding the new transceiver. As you can guess, this took more than a few (yours truly included) by surprise. Most, if not all, of the WebRTC server side implementations typically rely on SSRCs to work, as they’re needed for telling one packet from another and know what they’re about. As such, this was seen as a possibly breaking change by many, which also led to a lengthy discussion on the W3C WebRTC github repo and further exchanges during a W3C WebRTC WG intering meeting. As we’ve seen from the previous section, though, you don’t really need SSRCs in the SDP to be able to demultiplex traffic if rid values are advertised and used: in that case, in fact, inspecting RTP extensions to derive the proper rid/SSRC mappings implicitly can help applications still work as expected. This was exactly what I focused on a couple of weeks ago, which led me to publish a pull request with a patch for Janus to properly implement this functionality, which we already merged. 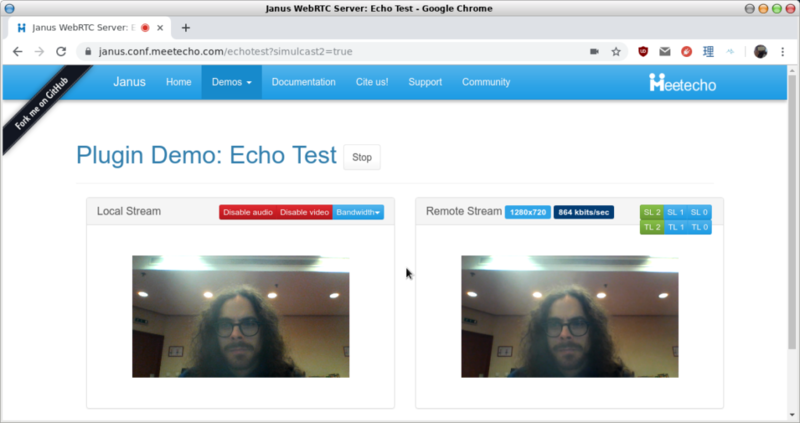 If you want to see this in action, you can re-use the Janus EchoTest demo we’ve already seen before: use a recent version of Chrome (74 or beyond), and pass the ?simulcast2=true query string. Notice how we’re specifying a different query string, here: this is because Chrome still supports SDP munging for enabling simulcasting the old way, and so this gimmick allows us to keep them both in place and use/test them separately. The outcome is, again, visually exactly the same as the previous two tests, which is what we expected: the user experience remains the same, with the ability of selecting what to receive back. by negotiating support for the relevant extensions and acknowledging the ability to receive the simulcast streams by their rid values. Then, once media starts flowing, the same things we introduced in the previous section start happening: we find out about SSRCs by looking at the rid values in RTP extensions, and then use that info to demultiplex traffic. It’s worthwhile to point out that, since Chrome implements retransmissions via rtx, the rid also helps identifying the SSRCs used for retransmissions, which is again very important as those values are not advertised anywhere in the SDP either. There are some more changes that happened within Janus as part of that effort (more specifically, in terms of how the Janus core and the plugins exchange information about simulcast support), but that’s not relevant to this article. You can refer to the previously referenced pull request for more info about that. While simulcasting works nicely most of the times, it’s not without issues. Some of them were known already, and others were identified during the latest IETF 104 Hackathon. More precisely, our friends from CoSMo prepared and led the WebRTC hackathon there, making sure a key group of people (including me, browser developers, CoSMo developers, our friends at |pipe|, and W3C staff) could work together on several activities. This included identifying different aspects to improve the current state of WebRTC together, and preparing KITE tests to automate the coverage of the related use cases and potential issues. Thanks to feedback from those smart folks around the table, I was able to identify a couple of simulcast related issues (one related to Firefox support, and another to H.264 keyframes), so that was definitely helpful! You can have a look at the outcome of those two very interesting coding days in this presentation. That said, one of the key issues in simulcasting today is how to configure, or figure out, the ordering of streams: e.g., which one will be low quality, which one will be high quality, and so on. As we’ve seen in the previous sections, when SDP munging it’s implicit that the first SSRC you add will be for the low quality feed, and the last for the high quality one, which means the order in the session description is important. That said, in Firefox and Chrome >= 74 this assumption is not always true, and can lead to confusion. The confusion becomes even worse when you think about which streams should be preferred over others when bandwidth is insufficient for all of them: should the browser always send a low quality feed, to have a fallback, or should it try to always send other layers instead, no matter the ordering of streams in terms of resolution/bitrate? Should there be a fixed rule, or should this be configurable? The IETF simulcast draft has words on that matter, but doesn’t address the ambiguity. As a result, the current implementation status in Chrome is a bit ambiguous in that regard as well, e.g., resulting in unbalanced bandwidth allocations under some circumstances, as explained in this issue page that was opened during the Hackathon. Some more considerations from a spec perspective were added on the github repo instead. Most importantly, as anticipated the lack of SSRCs in the new rid-based simulcast support in Chrome was not uneventful. There has been a lot of debate on whether they should be in the SDP anyway or not, and what would happen if they just disappeared. The specification is clear in that regard: SSRCs in SDP are not really needed, as mid/rid can help demultiplex traffic and associate it both to the right m-line, and to the right substream when available. On the other end, though, as anticipated almost all existing WebRTC implementations rely heavily on SSRCs to work, and a big change like that can’t happen overnight: we ourselves had to tweak the Janus code to make it work with SSRC-less simulcasting, and that won’t be enough if SSRCs will disappear entirely, e.g., in non-simulcast scenarios as well. This becomes worrisome when you realise that “SSRC-less” only works if mid/rid extensions are negotiated, and that if they’re not the session will be hopelessly broken since there wouldn’t be any mechanism at all for demultiplexing traffic: considering WebRTC endpoints may be communicating with, and receiving media from, legacy endpoints that don’t really know what mid or rid are, this could be very problematic. As such, a transition phase will probably be needed to ensure a smooth transition for most, and avoid breaking a huge chunk of applications that do work nicely at the moment. What’s next in Janus, then? Well, we’ve already given this some thought, and discussed this with other experts in the community. As anticipated, we don’t really have an issue with incoming media, as that’s been addressed during the related simulcast effort. Issues may arise for outgoing traffic, though, for a few reasons that would be boring to list here and now. The only reasonable solution to that and to the SSRC dilemma will probably be implementing proper mid/rid extension support for outgoing traffic as well (as we currently only do that for incoming RTP packets, but disable them on outgoing offers), which will hopefully ensure that things won’t break just because we’re routing the wrong RTP extensions due to the flexible logic we have in plugins. This would be especially needed for all those scenarios that involve media coming from non-WebRTC sources, e.g., SIP gatewaying or broadcasting via the Streaming plugin. As such, expect some effort in that direction soon! Unfortunately, backwards compatibility is always hardest part and great that you pointed out this concerns. Very good questions, Ben, and things I should have probably mentioned in those last sections! With respect to , there is no explicit mechanism for that yet, which is indeed unfortunate. There have been proposals, but nothing that has translated to something we can really use. As such, what we all do is use some timer: you don’t see traffic for a layer for a specific amount of time, you consider it paused. Suboptimal, but does its job. In Janus this threshold is 250ms. For  instead, yes, you do need to rewrite most of that: in Janus we update the RTP header (timestamps and sequence numbers), and when VP8 is used we overwrite the picture ID as well. How do you decide when to change a layer for a receiver and avoid changing layers too frequently? Do you have up/down threshold? How do you decide what layer to choose when you have several senders(webcams) based on the total BW of a receiver? Do you need to wait for a keyframe before switching between layers? We don’t do automatic layer changes based on bandwidth (check PR #1205 for why), we leave choosing the target up to users or applications. We only change layer automatically when a target layer isn’t available and we fallback to a lower layer, or when a higher layer than the one you’re receiving becomes available again. We do wait for keyframes at every layer change. For more info you may want to have a look at the Janus code. Pretty much the whole logic is in utils.c, with only bits in plugins and rtp.c. 2 Pings/Trackbacks for "Simulcast and Janus: what’s new? (and where’s my SSRC?)"